Quantity: An average of 12 pounds of tomatoes and 4 pounds of okra or zucchini is needed per canner load of 7 quarts. 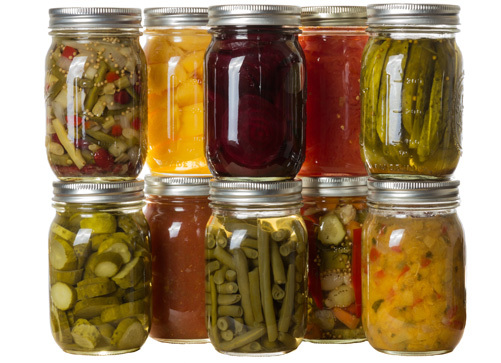 An average of 7 pounds of tomatoes and 2-1/2 pounds of okra or zucchini is needed per canner load of 9 pints. 2. Wash tomatoes and okra or zucchini. 3. Dip tomatoes in boiling water 30 to 60 seconds or until skins split. Then dip in cold water, slip off skins and remove cores, and quarter. 4. Trim stems from okra and slice into 1-inch pieces or leave whole. 5. Slice or cube zucchini if used. 6. Bring tomatoes to a boil and simmer 10 minutes. 7. Add okra or zucchini and boil gently 5 minutes. 8. Add 1 teaspoon of salt for each quart to the jars, if desired. Fill jars with mixture, leaving 1-inch headspace. 9. Wipe rims with a clean damp paper towel, apply two-piece lids, process in a pressure canner according to the recommendations. 10. Let cool, undisturbed, 12-24 hours and check for seals.